African Sky is ready to build our next school in Mali! While teachers and students in the United States settle in to a new school year, our African Sky construction team is preparing to build our fourth school. For this new school located in Zeala, a community in western Mali, we have an exciting new idea and a building design that combines the best elements of the schools we recently built in Soumabougou and Dissan. In October, Yacouba and our construction team will transport our brick press and materials to Zeala, the community that runs African Sky’s most inspirational women’s literacy program. 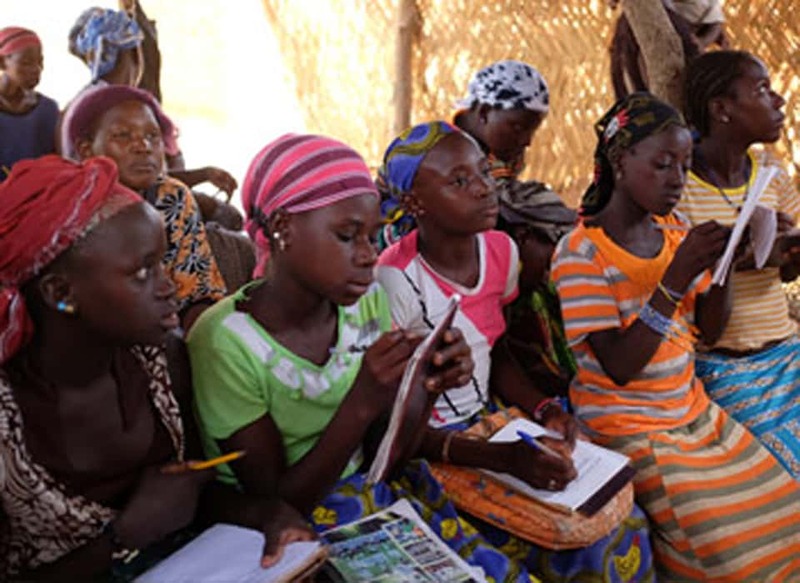 In only a few short years, our Zeala project partner, Elizabeth Traore, has established a model literacy program that we plan on replicating in other Malian communities. African Sky sponsored Elizabeth and her formal training as a literacy instructor, and in less than three years she built an amazing literacy program that brings together women of all ages to support each other as they learn to read, write, and do basic math. The only problem Elizabeth’s literacy program has faced is meeting demand! Because she is attracting more and more students, earlier this year Elizabeth requested funds to buy more benches for her class. This past summer, Executive Director Scott Lacy and Associate Director Colleen Naughton visited Elizabeth and her students in Zeala to celebrate their success and to see a demonstration of the literacy program in action. They met with Elizabeth and dozens of her motivated and energized students. The students showed off their writing, reading, and math skills, they showed us the modest house they built to support initiatives like a community cereal bank, and then shared a generous meal followed by singing, dancing, and a prolonged farewell. Based on the success of Elizabeth’s program, including the industrious efforts of her students to build and maintain a basic shelter that serves as their classroom, African Sky has decided to further invest in these community heroes. African Sky will partner with the Zeala community to build our very first literacy school. Even villages with primary schools cannot serve every child in the community. Many children miss out on school because they are needed in their households for food production or other critical needs. Girls, in particular, are less likely than their male counterparts to enter school, and even fewer finish the 6th grade. African Sky has always focused on education projects as part of our project portfolio, and now we are proud to partner with Elizabeth and Zeala to build a literacy school that will serve women of all ages who, for one reason or another, were unable to attend primary school. The Zeala Literacy School will enable Elizabeth’s program to grow. In addition to literacy and math (basic and advanced levels), the school will also become a center for these students to organize and deploy income-generating initiatives. By combining education and entrepreneurial opportunities, Elizabeth and the Zeala Literacy School will raise the bar high and create a model for literacy projects in other African Sky host communities. Previous Post With Help From Nova Scotia, AS Opens Dissan Secondary School!